The Kingdom of Saudi Arabia is visited by millions of pilgrims each year especially in the season of Hajj and to accommodate them conveniently in the cities of Makkah and Medina assortment of Hotels are sited near the holy places. The pilgrims wish to pick the hotels that are nearest to Masjid e Nabawi and Masjid e Haraam. Recently, an opening of Hotel Crowne Plaza adds on to the options available to the pilgrims. Having 506 rooms and suits on multiple floors, this hotel is one of the largest in Saudi Arabia. The best thing about it is its location apart from all the facilities and lodging options it offers to its guests. Just a few steps from the hotel will take you to the Prophet’s Mosque (Masjid e Nabawi) in Medina. 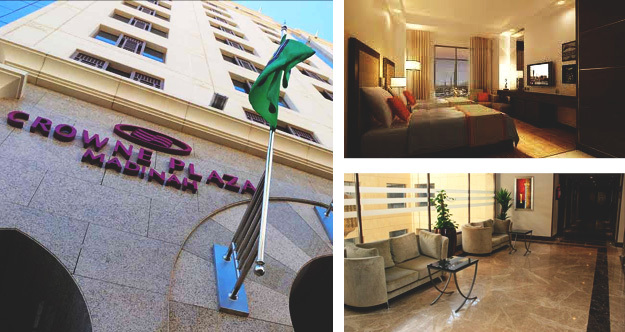 The opening of Crowne Plaza in the sacred city of Medina was reported on Wednesday by the Intercontinental Hotels Group (IHG). IHG presently operates 23 hotels and these hotels accumulate to feature an entirety of 5,600 rooms in all of the Gulf Kingdom. In Makkah and Medina, three hotels from the IHG are already being operated and ranked high by its guests. Crowne Plaza Medina is the fourth one in the chain.